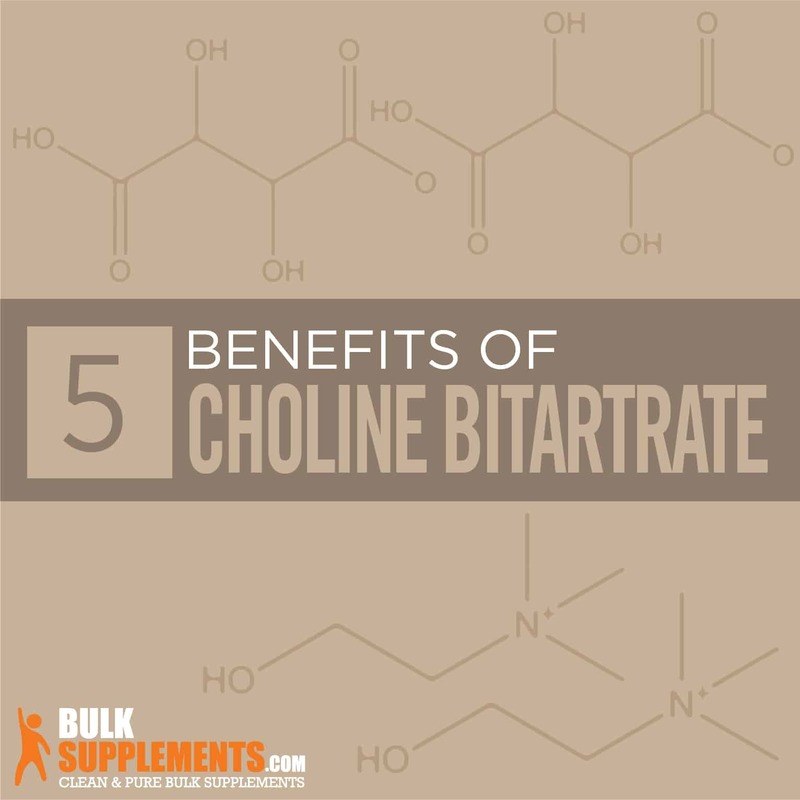 Choline bitartrate is the salt form of choline, an essential nutrient found in food and supplements. It helps the body stabilize choline and turns it into acetylcholine–a neurotransmitter essential to learning and memory–and lecithin, a fat essential to cells in the body (x). In addition to being an important brain booster, choline also supports the liver by helping it produce the chemicals it needs to remove cholesterol from the body. Choline is a key player for healthy nervous systems, too, as it helps regulate the production of DNA. Getting adequate amounts of choline may also reduce inflammation, which can lead to a number of diseases, including cancer and diabetes. One of the most important functions of choline is to help maintain healthy brain function. Choline may support fetal brain development and prevents neural tube defects (problems of the brain, spine and spinal cord) (x) (x). Choline also improves cognitive performance, especially in older adults. One study showed that higher intakes of choline improved both short-term and long-term memory in elderly research participants with poor memory (x). Some studies have shown choline may help with mood illnesses, such as anxiety and bipolar disorder (x). Choline is essential for heart health. Along with folate, choline helps break down the amino acid homocysteine. Without enough choline and folate, homocysteine accumulates in our blood; high levels of this amino acid are associated with heart disease and stroke (x). Without enough choline, too much fat and cholesterol accumulate in the liver. This can cause liver damage and disease, including non-alcoholic fatty liver disease. 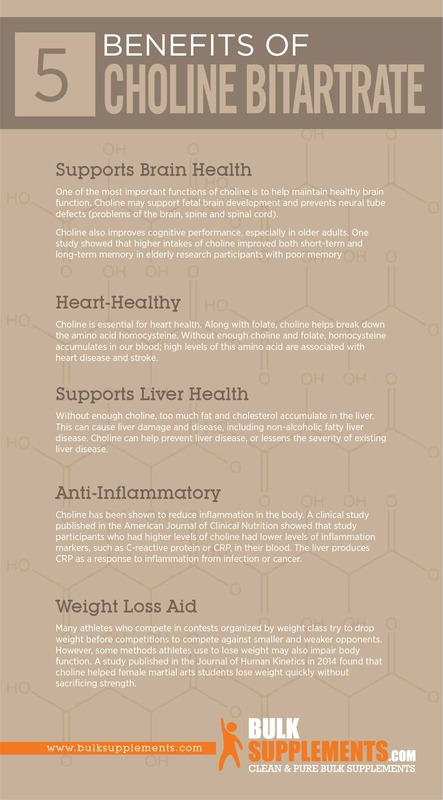 Choline can help prevent liver disease, or lessens the severity of existing liver disease (x). Choline has been shown to reduce inflammation in the body. A clinical study published in the American Journal of Clinical Nutrition showed that study participants who had higher levels of choline had lower levels of inflammation markers, such as C-reactive protein or CRP, in their blood (x). The liver produces CRP as a response to inflammation from infection or cancer. Many athletes who compete in contests organized by weight class try to drop weight before competitions to compete against smaller and weaker opponents. However, some methods athletes use to lose weight may also impair body function. A study published in the Journal of Human Kinetics in 2014 found that choline helped female martial arts students lose weight quickly without sacrificing strength (x). Pregnant and breastfeeding women may have lower levels of choline because the fetus also needs it for normal development. Consequently, doctors prescribe pregnant women higher doses of choline to maintain the health of both the mother and the baby. Estrogen is a key player in the manufacture of choline, and estrogen levels tend to decline during menopause. As a result, postmenopausal women may also be at risk of choline deficiency. Endurance athletes deplete their choline levels during long-lasting athletic events. Those who drink a lot of alcohol typically have lower choline levels, which can make them more susceptible to fatty liver disease. Choline can be found in liver, muscle meats, spinach, peas, eggs, wheat germ, fish and nuts. Other vegetables such as cauliflower and Brussels sprouts also contain choline. Because it’s also a component of lecithin, it can be found in foods that add soy lecithin as an emulsifier to make processed food more shelf-stable. High doses of choline taken orally may increase the likelihood of stomach upset, nausea and vomiting. Extremely high doses may cause sweating and a fishy body odor. An average American diet provides 200 to 600 mg of choline per day. 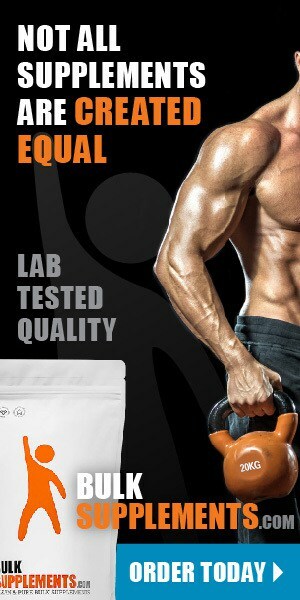 For adults, the upper recommended limit is 3.5 grams (3500 mg). It’s recommended that adult women (who are not pregnant or breastfeeding) get 425 mg per day, and adult men 550 mg per day (x). Choline l-bitartrate powder: As a dietary supplement, take 600mg (rounded 1/4 tsp) once or twice daily with food, or as directed by your physician. Choline l-bitartrate capsules: As a dietary supplement, take 1 capsule (240 mg) once or twice daily with food, or as directed your physician. Choline is an essential nutrient for human health. It’s not only key for maintaining brain function but also essential for the health of your liver. It reduces inflammation at the root of many diseases and could even help you lose weight.